Geithner spent most of his early years living abroad and graduated high school from the International School in Bangkok, Thailand. He went on to study Mandarin in two universities in China in 1981 and 1982, and then returned to the U.S., where he earned a B.A. in government and Asian Studies from Dartmouth College in 1983. Two years later Geithner received an M.A. in international economics and East Asian Studies from the Johns Hopkins University School of Advanced International Studies. During the early 1980s, Geithner's father oversaw the Ford Foundation's microfinance programs which Ann Dunham Soetoro, Barack Obama's mother, was developing in Indonesia. The elder Geithner met Ms. Soetoro in person at least once. In 1988 Timothy Geithner went to work for the Treasury Department, where he held various positions before leaving to join the Council on Foreign Relations in 2002. He was also the director of the Policy Development and Review Department at the International Monetary Fund from 2001 to 2003. In 2003 he was appointed to the office of President of the Federal Reserve Board of New York. In 2008 he arranged the sale of Bear Stearns and helped Henry Paulson, the former CEO of Goldman Sachs, in deciding to bail out the failing AIG Insurance Company. In November 2008, then President-elect Obama nominated Geithner to be Secretary of the Treasury. During Geithner's Senate confirmation hearings, it was discovered that he had failed to pay $35,000 in back taxes for income he had earned during past periods of self-employment. 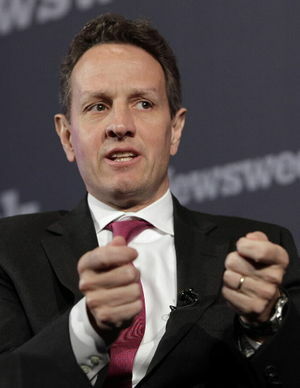 In response to this revelation, Geithner blamed his transgression partly on Turbo Tax (a software package designed for people who wish to prepare their own income taxes), and partly on his own mistaken belief that he was an employee (whose taxes had been automatically withheld from his paychecks) rather than a self-employed contractor while he worked for the IMF. A Senate report, however, stated that Geithner had been clearly informed of his status as a self-employed contractor at that time. Geithner was confirmed as Secretary of the Department of Treasury in January 2009. "[I]f we want an economy that's going to grow in the future, people have to understand we have to bring those deficits down. And it's going to be difficult, hard for us to do. And the path to that is through health care reform. But that's necessary but not sufficient. We're going to do some other things as well." This page was last modified on 19 December 2010, at 22:45.